Each year, Groundhog Day is celebrated on February 2. Many people don’t know anything more about the day than what they learned from the 1993 movie with Bill Murray. 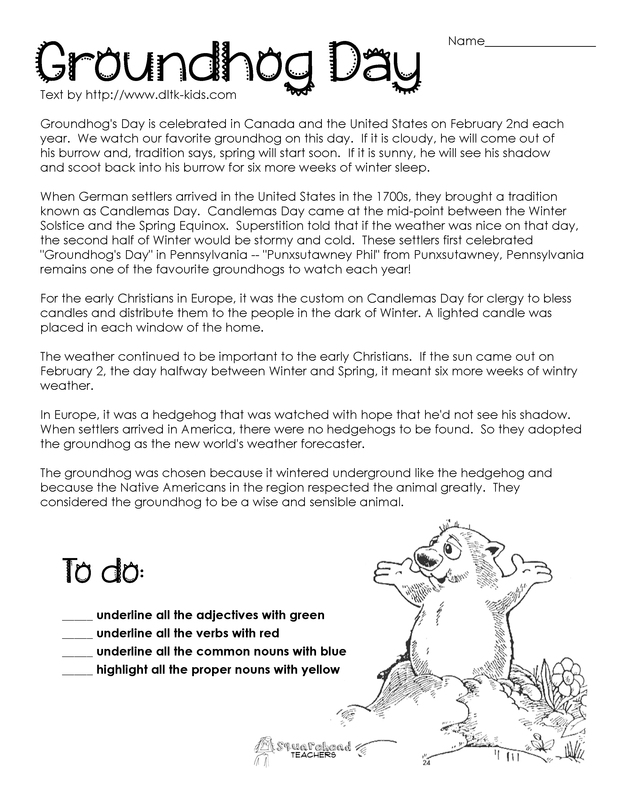 So here are 2 short activities for your classroom that incorporate parts of speech practice and the history of Groundhog Day. The upper grade version of this activity asks students to color code nouns (common and proper), verbs and adjectives. The lower grade activity (recommended as a whole class activity) only deals with common and proper nouns in the passage. Happy Groundhog Day! This entry was posted in Grammar, Holidays/Seasons and tagged Children, Education, Elementary School, Homeschool, Kids, Teacher Resources, Teachers, Teaching by Squarehead Teachers. Bookmark the permalink. Love the passage but it prints out very very blurry?! 😦 any tips?